Powered by Mom Blog is pleased to share the latest flash giveaway from the Pay it Forward Crew! 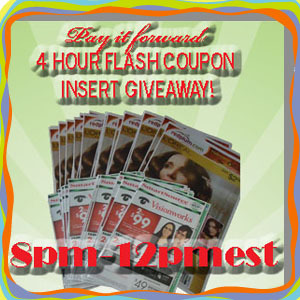 You have exactly 4 hours to enter to win the prize tonight of 20 Unclipped Coupon Inserts! I like coupons for cereal. They really bring down the price when you use the coupons while cereal is already on sale. I like the Frozen food Coupons. Its nice to stockup the freezer. I like baby coupons, frozen foods and cereal. My favorite coupons are the ones that give me an item for free or nearly free. Those are the best! I love coupons for hair care/coloring products, because I always buy so many! I LOVE ALL coupons. I treat them as if they are money. I love couponing and saving loads of money for my family. I like coupons that make thinks free or as close to free as possible. Free are the best, otherwise ones that help me restock my stockpile. Coupons that double for free items! anything that can be doubled or “high value” coupons. I love to save money and i love free items! I hope i win! Target coupons are great. If its something I buy all the time, I clip those coupons. I love coupons where you get the item for free. I love flash giveaways! Thank you! I would love to win. Thank you so much for doing these!!! I am still trying to get the hang of couponing. I do fairly well, but need to get better at it and this would be a huge help!!! I love coupons to get free items. I just got a free box of triscuits today. Coupons that make an item free!